Evidence that communities are structured by deterministic processes has often been sought through analysis of patterns in species composition. Consistency in assemblage composition over time, and similarity in assemblage structure among locations whose environments are comparable, argues against randomness and in favor of underlying processes. The core community of eight taxa described earlier for the Broadstone Stream (Figure 10.5) was present throughout the more than 20-year study period, and species turnover generally was low. This high persistence of assemblage composition and dominance by the same handful of species in the Broadstone Stream strongly suggests that the local assemblage dominants are not simply a random sampling of a larger species pool, but instead are those whose attributes allow them to be especially successful in the environmental conditions at that location. The degree of community persistence appears to vary depending on environmental conditions, for reasons that are only partly understood. Two surveys of 27 streams in the same locale as the Broadstone Stream suggested greater persistence within cold- than warm-water streams (Town-send et al. 1987). Species persistence of fish assemblages was high and similar in two streams surveyed 9 years apart, but the difference between the two collections was greater in the stream that exhibited higher seasonal and year-to-year variation in flow regime, maximum summer temperatures, and frequency of dewa-tering (Ross et al. 1985). Other studies that have reported less overall persistence in assemblage structure (Grossman et al. 1982) have attributed this finding to environmental variability. Based on 10 years of sampling in Coweeta Creek, North Carolina, Grossman et al. (1998) concluded that environmental variability in flows rather than habitat or resource availability best explained variation in fish assemblages. Indeed, lack of assemblage persistence or of relationships between species composition and habitat variables may be a frequent finding wherever unpredictable floods and droughts introduce high temporal variation into stream assemblages (Angermeier and Schlosser 1989). Spatial comparisons of biological assemblages also provide insight into the roles of structuring mechanisms versus chance in community assembly. 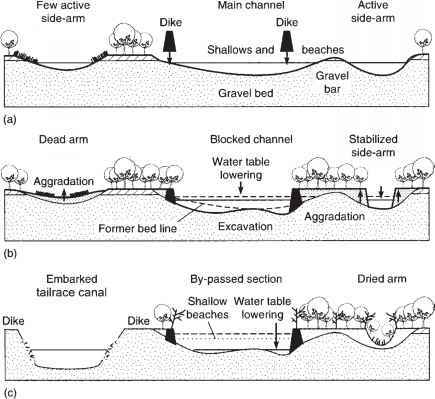 Arguing that a neutral model based on dispersal would lead to greatest similarity amongst adjacent sites, whereas community structuring mechanisms are supported if assemblages from different streams resemble one another to the degree that their local ecological conditions also are similar, Thompson and Townsend (2006) compared macroinvertebrate assemblages from ten grassland streams in the Taeiri catchment, South Island, New Zealand. Assemblage similarity was best explained by spatial proximity for species with low dispersal ability, a mixed model worked best for species with moderate dispersal abilities, and neither model worked especially well for species of high dispersal ability. The ability of such a comparison of natural assemblages to test niche versus neutral explanations faces an important challenge in the tendency for ecological conditions also to show spatial correlation. Because they could document no influence of distance on similarity of physical and chemical conditions for the ten streams, Thompson and Townsend (2006) judged this not to be a concern, and attributed the observed negative relationship between spatial distance and community similarity to distance limitations of aerial dispersal and the possible influence of chance order of arrival on community assembly. The fish assemblages of tropical floodplain rivers provide a natural experiment in community assembly because seasonal fluctuations in discharge result in repeated cycles of extirpation and colonization of floodplain habitat at the local scale. By experimentally manipulating habitat complexity, Arrington et al. (2005) showed that species differences in dispersal ability significantly affected assemblage response to habitat. Dispersal was most important to community dynamics in newly formed habitat patches, whereas abundances of individual species increasingly were influenced by habitat characteristics in older patches. Investigation of patterns in assemblage composition over time and space does not by itself provide strong evidence for the processes that underlie community structure. Nonetheless, this approach is indicative that patterns are repeat-able and persistent, and so encourages us to seek explanations. Dispersal and recolonization ability clearly play a role, interacting with the various environmental and biotic factors operating across multiple scales to determine which of the many potential colonizers will be successful in establishing local populations.